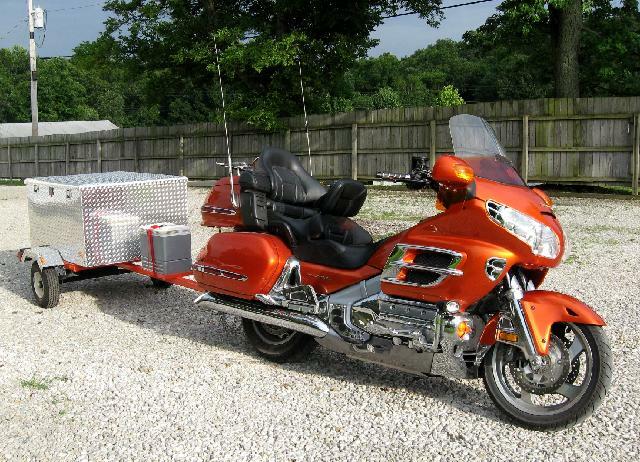 This past winter I repainted the motorcycle trailer orange to match the Goldwing and did some re-lighting and re-wiring. A month or so back I changed the hinge system to allow the lid to open all the way. While I was working on it I started thinking about its size. The container is 18" tall. 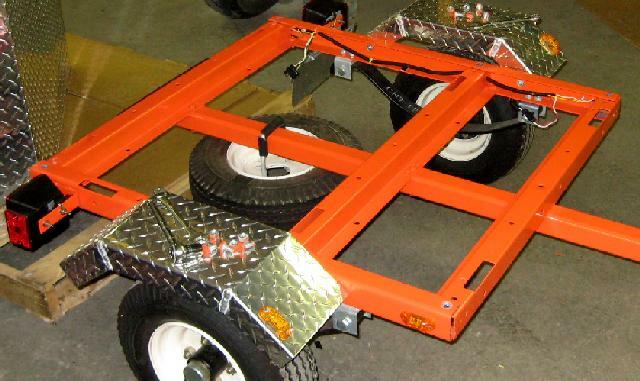 The trailer is cut down to 38" x 36". 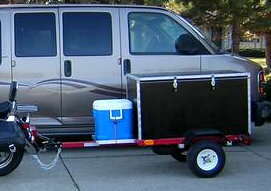 The front of the container sticks over the front of the trailer frame about 16". Like engineers do I thought to myself...if the container were made of clay, and you reformed it into a cube, it would be close to being the size of the trailer and 18" tall. From this I calculated a volume...14.25 cubic feet. Hmmmmmm. The container is advertised as 18. It doesn't take much to fill it up, and due to its curves and swoopiness there is a noticeable amount of wasted space. 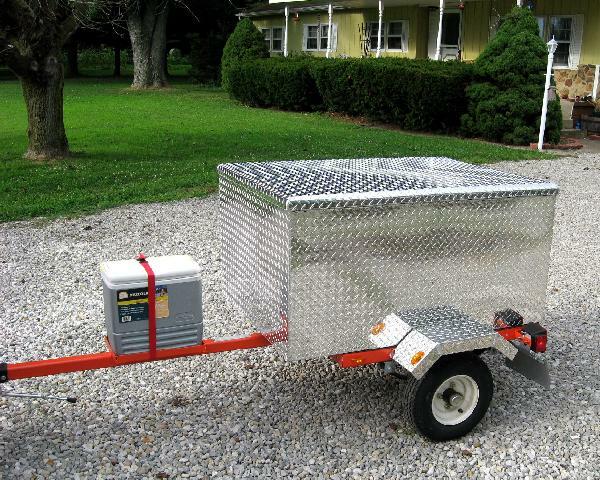 From time to time on the internet forums I've seen pictures of other people's trailers (like above). I've always liked the ones that are basically boxes. It just seemed like they would have more usable space and generally be larger. 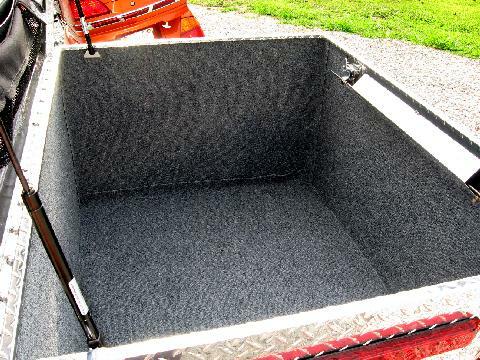 I've pondered replacing the cargo box with a tool chest or two. I was never able to find something that would fit in the space I have, or anything I thought would work well. 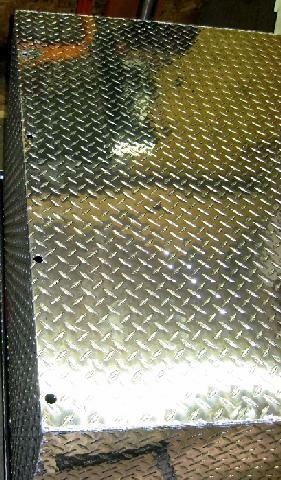 Plus, the price on the aluminum diamond plate tool boxes is very high anymore. 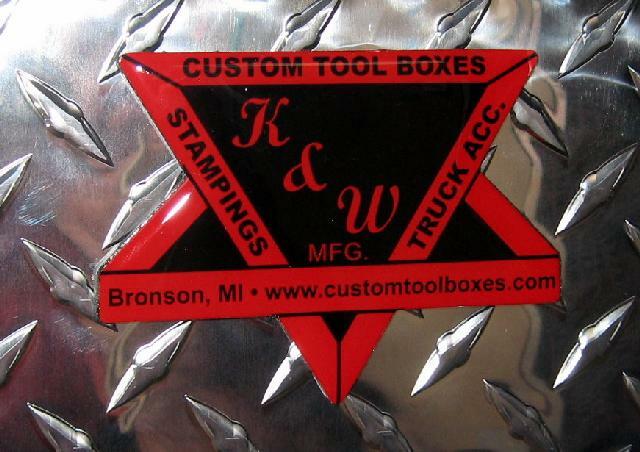 One day I was surfing the internet checking out tool boxs and such when I happened upon K&W Manufacturing in Michigan. They advertised boxes built to your size so I sent them a request for a box 4'x3'x2'. 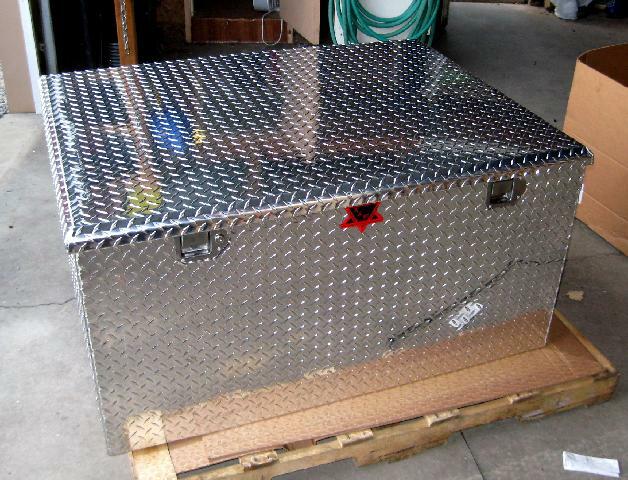 Given the prices of truck tool boxes I'd seen I expected the thing to cost $700-800 at the least. I was pleasantly surprised when I got a quote of $399 plus freight. I emailed some drawings to Jeff Krull at K&W and ordered the box. A couple weeks later I received the box. 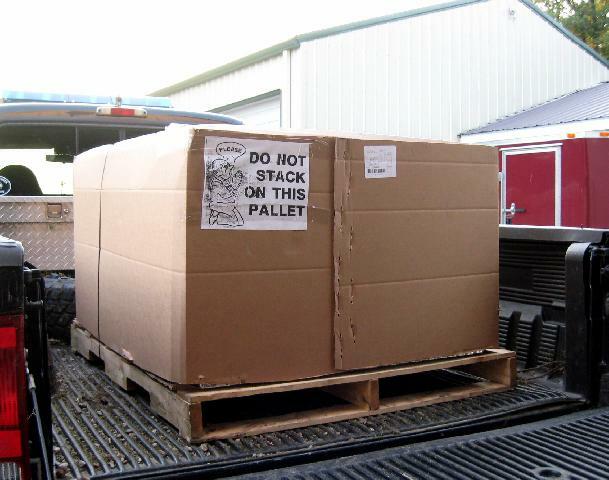 The freight company delivered it to the ambulance station and I picked it up after work. Here is the box. A beautiful piece of work. 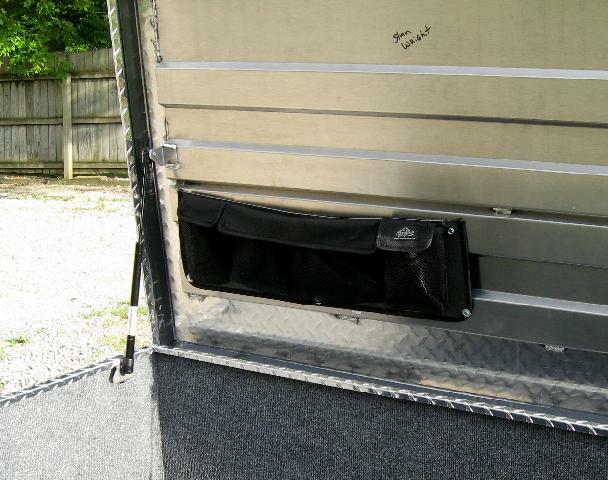 Locking latches, nice formed edges, weatherstripping, and 24 cu. ft. of storage space. 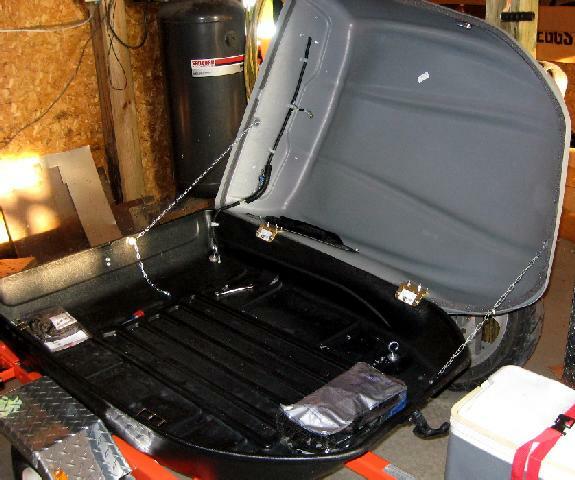 I hadn't specified gas shocks, and planned on using a chain to hold the lid when it was open. Imagine my surprise when I popped the lid and it sprang to life! I removed the cargo carrier. I also removed the bolts that hold the side rails to the cross braces. I'll use these bolt holes to mount the box. 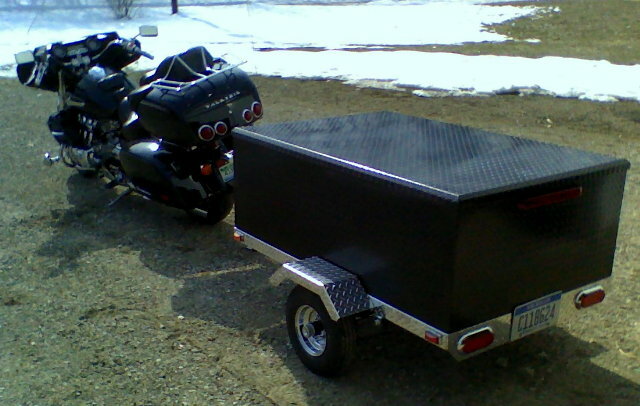 I measured the distances between the bolt holes on the trailer and transferred those measurements to the new box. I drilled 5/8" holes for the 3/8" bolts to allow for adjustment. I set the box in place, centered it, and bolted it down. I let the box hang over the rear one inch. 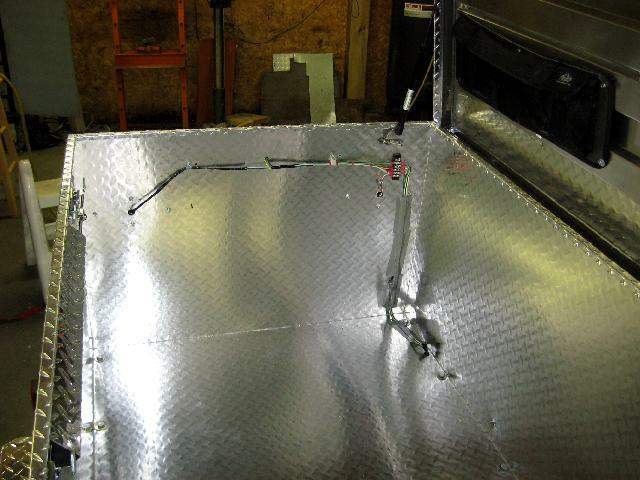 This will protect the running lights on the trailer some and keep them from glaring onto the aluminum. 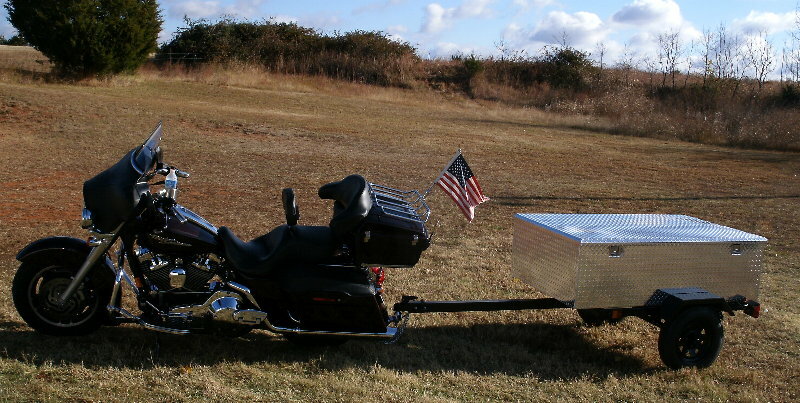 While I was installing the bolts I accidently put too much weight on the trailer and bent the bicycle stand on the trailer. Oops! 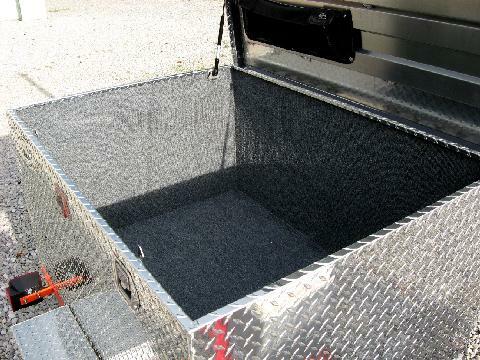 I used tool chest liner between the box and the trailer frame to keep the diamond plate from chewing up the paint. I wired and mounted the lights. Next I prepared the carpet. I bought it at Lowes...cheap, outdoor, gray carpet. I had grand plans of building a removeable carpet tub but in the end I did it in pieces. The carpet turned out well I thought. I used 3M spray-on adhesive for the side pieces. I left the bottom section removeable for cleaning. I put a leftover organizer on the lid to hold paperwork and stuff. 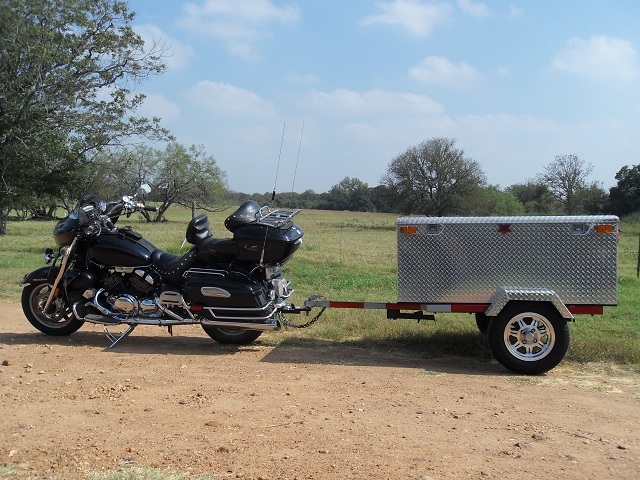 I think the new trailer will serve me well. 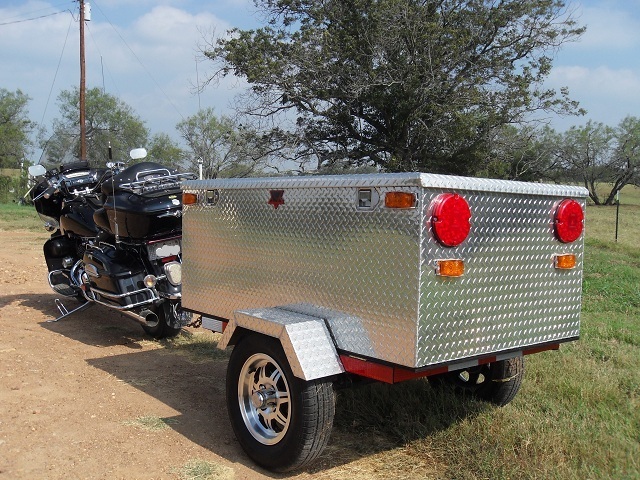 It's big enough to tow behind the Jeep if needed. Update - The trailer worked great on our Blue Ridge Parkway trip. It now has the nickname "The Dumpster". 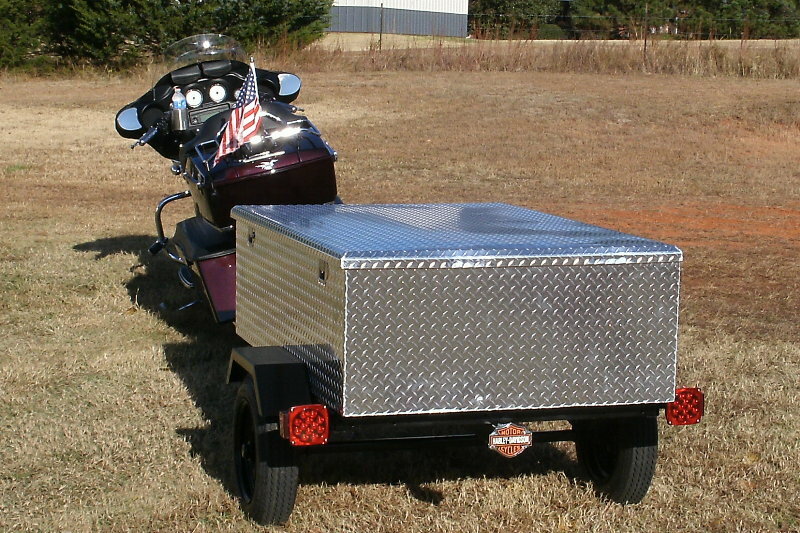 If I were going to build a new trailer I would leave the trailer platform its original 48" x 40" size and have the box made to match...maybe dropping the height to 21" or so to make it easier to reach the bottom. Update April 2009 - Received this email with more sizes and pricing: "Hi Stan, Just a FYI note. 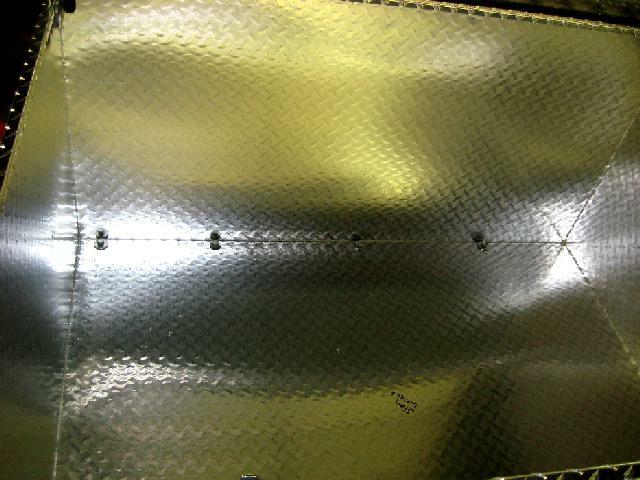 I talked with Jeff Crull at K&W yesterday and he quoted me $480 (+shipping) for a 40"W X 60"L X 24"H box like yours. That is a very good deal. As soon as I arrange for a buisness drop off location I will be ordering from him. 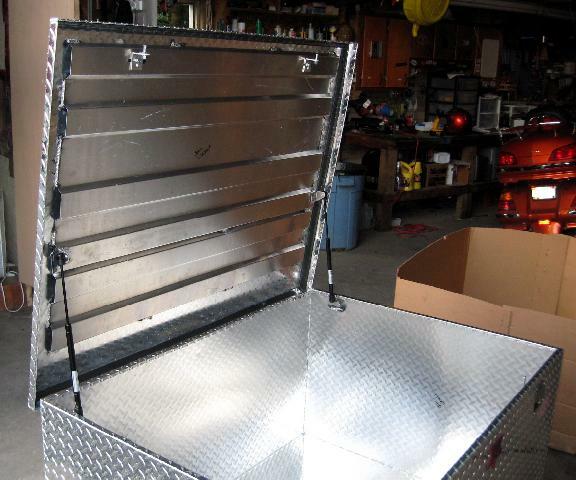 I saw your note on the bottom of your site If done over you would leave the frame 40" and have a box built that size so I thought I would pass this price along to you in case you run across someone thinking of building one like yours. Thanks again for the info! , Mike ". Thanks Mike! Update September 2009 - After using my trailer for a couple years, seeing Mike's trailer sizing (above), and seeing other trailers, if I were gonna build another one I'd go 40"W X 60"L X 18"H. I find the 24" height is hard to reach down into and some space at the top is wasted. 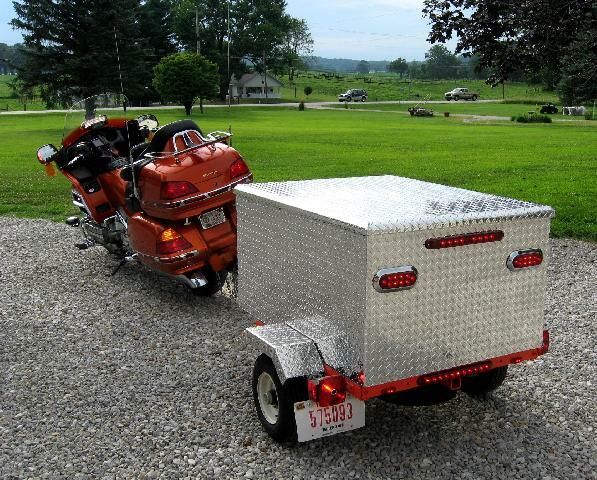 It would also make the trailer wider and and not as tall. 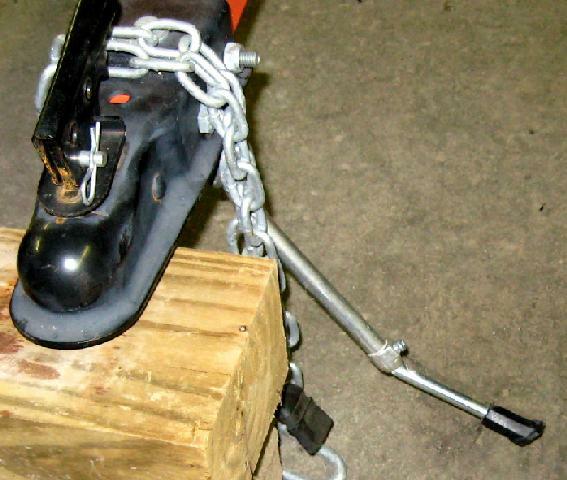 Update August 2010 - I found a nice jackstand to use. 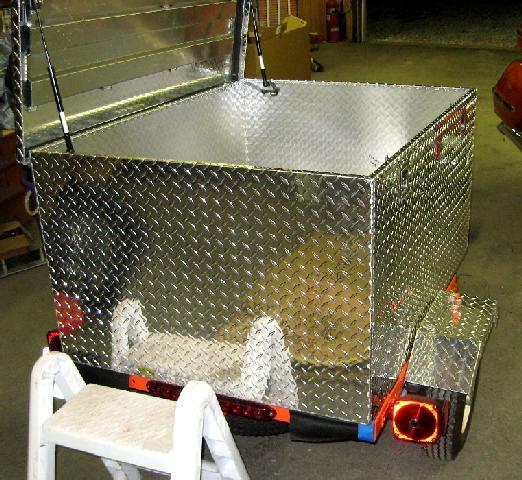 HF frame with single leaf springs, Tongue moved out one notch, 40"W X 60"L X 24"H Box and fenders custom built by Custom Tool Boxes ,Box mounted 60% in front of axle, 12" wheels from trailer-wheels.com , 155/80R12 passenger car tires, LED lights all around and all lights made by GROTE and mounted as high as possible trying to get close to eye level for cagers to see, Trailer stand from etrailer , Inside carpet from Lowes, Black rattle can paint and DOT regulation reflective stickers. 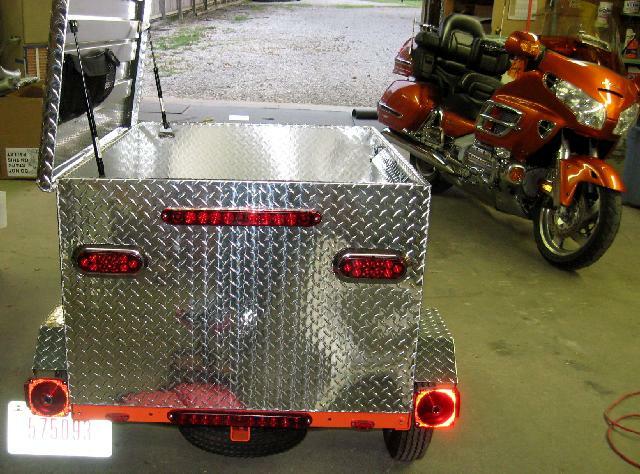 5 wire set up using yellow clearance lights in rear for turn signals. 215 pounds empty and roughly 400 pounds loaded. 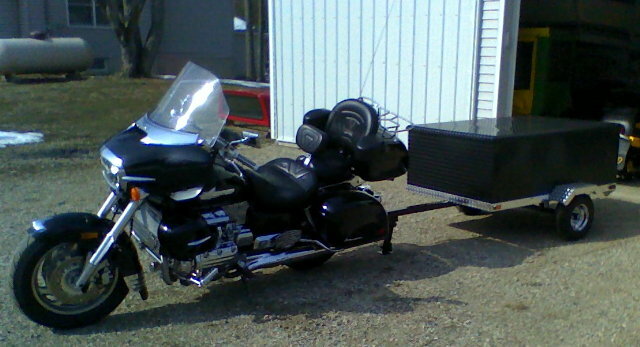 Have pulled it just over 2100 miles with both my Goldwing and Venture and it pulls GREAT! Update January 2011 - I received these pictures from Jeff Delano. He built a 40x60x18 version. Update April 2011 - I received these pictures from John Hoffman. He built a 40x60x20 version. 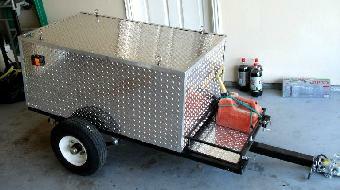 Stan, just thought I'd pass along some pictures of my trailer I built with help from your site. 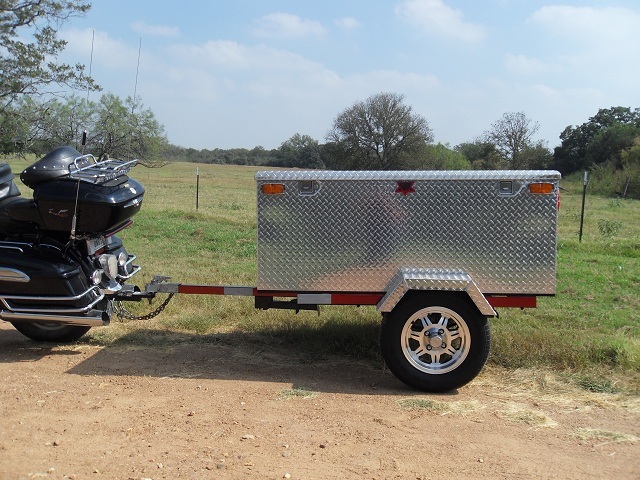 It's a HF trailer with a 40"x60"x20" box, powder coated black to match bike and some bright diamond plate to cover trailer frame. LED lights and padded carpet inside. Chrome wheels from HF top it off. 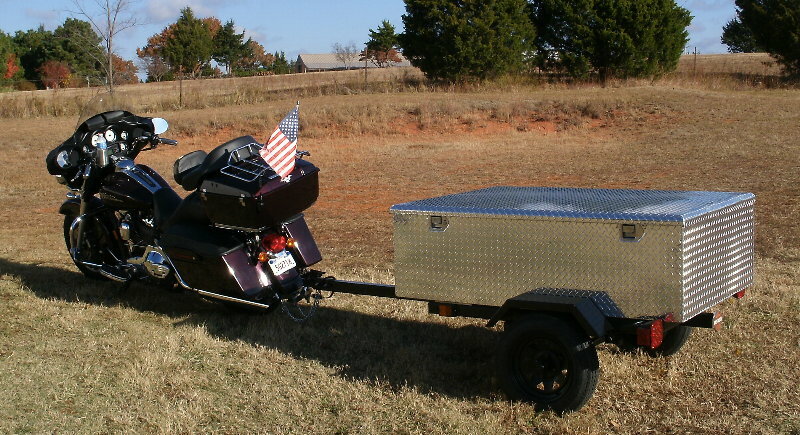 I have about $750.00 into it and it weighs around 200#. Thanks for your site, it offered great help in finding what I needed and how I wanted it to look. Thanks again.